Included on these pages are photographs of over 1500 primary type specimens. The types are organized by museum; clicking on one of the links below will return a list of the types at that museum ordered by genus and then by species. A definition of types can be found here. NEW! Types located in the Australian National Insect Collection in Canberra, Australia. Marianne Horak assisted in finding the specimens and verifying the data. Specimens in this section are verified as being the correct specimen for each type listed; any exceptions are listed in the "Notes" field for that specimen. Types located in the National Museum of Natural History, Smithsonian Institution, Washington D.C. These photos correspond to the list of USNM types compiled by John Brown (here). 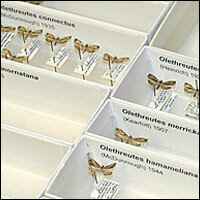 All specimens are verified as being the correct specimen for each type listed. Types located in The Academy of Natural Sciences, Philadelphia, PA. This section contains many Clemens types and a few from other authors. Specimens in this section have NOT been verified to be the correct specimen for the type listed; in many cases the "Type" label associated with the specimen does not designate a primary type. Any type information taken from this section must be verified by the researcher prior to use.